An award-winning blog that chronicles the adventures of an incredibly well-travelled family as they explore over 80 countries and all 7 continents. A well-traveled dad and winner of Conde Nast, Forbes and CNN awards for travel writing and photography, Eric Stoen is the man behind Travel Babbo, which derives its name from the Italian word for “father,” (or as he jokingly likes to remind people, “idiot” in other parts of Italy). 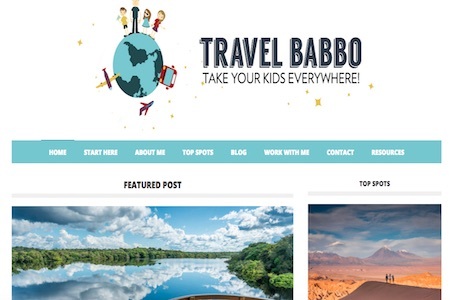 Travel Babbo is one of the most, if not the most, comprehensive travel guides online today and caters all of its content towards travelling with children. Stoen has been to over 80 countries and all 7 continents, meaning he’s an expert on travel hacks and tips, especially now that he’s travelled all over the world with his three young children. On the site, you’ll find a helpful “Start Here” guide that is filled with lots of travel hacks, photography tips and more. Then, you can move on to the regular blogs where you’ll find everything from coverage of what a particular destination is like with kids to the top hotels in each city that are kid-approved. The content is never-ending, well-researched and always accompanied by amazing photos. 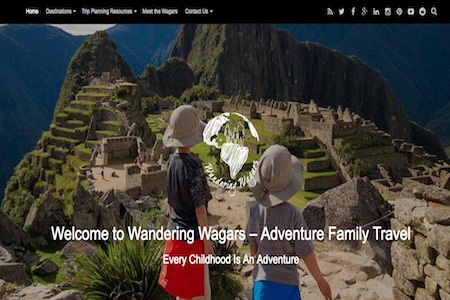 Similar to a National Geographic-style magazine, The Family Adventure Project is one of the most comprehensive family travel blogs out there due to the in-depth content and reviews they provide. Instead of providing general travelling with children tips, The Family Adventure Project really delves into each location in a way that makes you feel like you’re reading a National Geographic guide. What’s particularly impressive and outstanding about this blog is that it is catered towards parents of children who are a little bit older and also features a philosophy section that covers topics such as general parenting, adventure parenting, education and more. 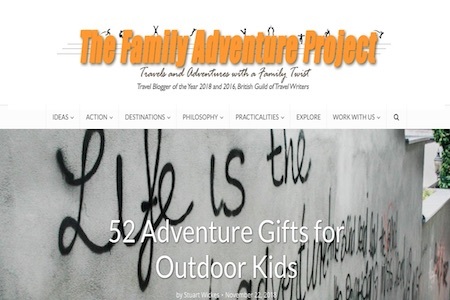 Impressively organised and stock full of in-depth travel content, The Family Adventure Project likely has a blog for exactly the vacation or adventure you’re looking for. You’ll especially want to check out the “Action” section as well as the “Ideas” one, where you’ll find loads of content about where to travel if you’re feeling stuck or even what activities to do. This blog is impressive, to say the least, but it tops the list for the sheer amount of high-quality content that’s catered towards families of any size and adventure level. Run and operated by parents who've made it to over 53 countries together, this blog provides general family travel hacks while also focusing on the menial tasks of adventuring, such as travel insurance and hotel check-in tips with kids. It’s hard to find a more experienced pair of travelling parents than those behind Y Travel. The family, who has visited over 53 countries and recently took an 8-month trip around Australia with their children, has years of experience travelling with little ones on board. Their experience shines through their content as each post is thoroughly researched, well-written and chock full of great insider tips catering to families. 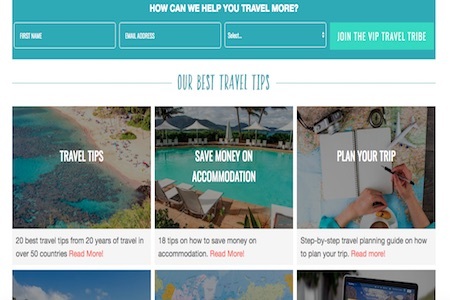 Their “Start Here” section is filled with tips for families looking for advice on how to save before a big trip, how to take out travel insurance and even how to take care of menial tasks like car rentals and hotel check-ins. What makes their blog so fantastic, aside from the ample amounts of content, is the fact that they even cater to different family travelling styles, such as trips for blogging, family trips and even travelling solo as parents. Their city guides are particularly helpful and cover everything from how to get WiFi, where to stay and what to be sure not to miss. Travel blog meets homeschool tips in this impressive blog that has content geared towards both parents and their children. If you're looking for a way to educate your children while travelling, this is the blog for you. 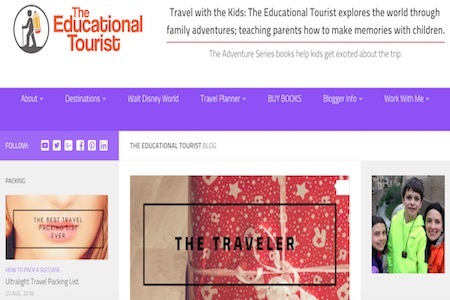 If your children aren’t particularly excited about new adventures just yet, then you’ll definitely want to have them take a look at The Educational Tourist. While other blogs cater to family travel, this blog has content for both the parents and their children. Complete with travel guides specifically for kids, The Educational Tourist is definitely more geared towards the little ones and how to make them happy, and we absolutely love it. With blogs that range from discussing travel planning tips to how to DIY your own Mickey Mouse ears and even a list of books to get kids excited about adventures in the Caribbean, this is one of the most unique travel blogs we found. In some of the sections, the blog delves into the history behind certain travel destinations, such as a creative look at Greek philosophers that you can read with your children before heading to Athens or Santorini. The parents behind the blog have even created their own YouTube channel with creative video content that adds a special touch to the blog overall. Travelling with children is a great opportunity to teach your children about life, which is what this blog does. With a philosophy focused on "worldschooling," the articles provide in-depth reviews aobut culture as well as the day-to-day facets of travelling with children. The philosophy that the Wandering Wagars take on about educating their children is in “worldschooling” the kids by introducing them to various different cultures, food, and sights. 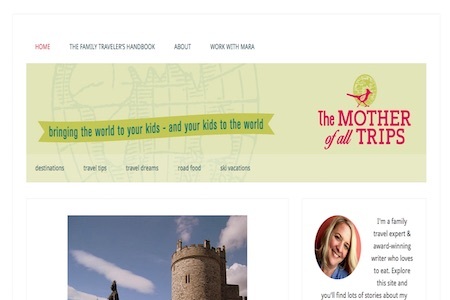 A top-notch source for any curious parent around the world looking for inspiration and advice on how to travel with children, this blog is so great that it’s been featured on Lonely Planet, Trip Advisor, Expedia and many other top travel outlets. Their content is especially helpful if you’re looking for tips on how to travel with babies or are wanting a solid review of a travel product. Their content often focuses on the safety of travelling to various international locations with children and is very open and honest about the requirements of each city in terms of long travel times, the pros and cons of each type of transportation and more. Overall, the family employs an “experience over things” mentality that really makes the blog read as authentic and engaging. Parents of babies and toddlers, listen up! This blog is for you. Normal family travel blogs are written for families with young children, but this one is delightfully different by focusing all of their articles around travellling with babies and toddlers as well as activities you can enjoy with them. Unique in that the articles are focused on holiday travel specifically for babies and toddlers, Kiddie Holidays tops the list for the unique angle it takes on providing tips and travel hacks to parents of younger children. Blogs are highly visual and mainly provide tips for travel within the UK but are also incredibly informative for those looking for specific activity ideas. Some of their blogs even cover topics such as “Top 10 Dinosaur Days Out for Toddlers” and “50 Amazing Baby and Toddler Hotels in Europe,” which is consistent with their branding in that they seem to provide comprehensive lists that are easy-to-read and filled with great information that cuts through all the fluff. 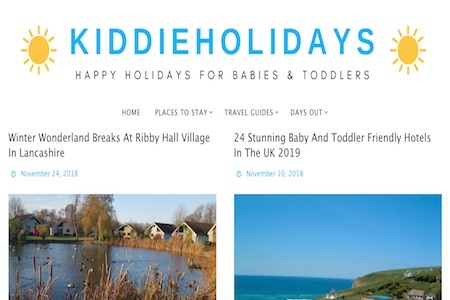 Kiddie Holidays is broken into three main segments (Places to Stay, Travel Guides, and Days Out) to make it easy to sift through and includes content covering destinations within the UK as well as other faraway holidays in places such as Australia. You'll find a little something of everything in this blog, which is equal parts a guide on how to be great digital nomads while also providing honest, educational pieces about homeschooling and education abroad. What makes Bohemian Travelers so great is the equal amount of focus they put on content for digital nomad parents and travel schooling for kids. While the blog is home to a wide variety of travel guides filled with great tips for families, what really makes it stand out is the fact that they’ve got a whole section dedicated to digital nomad tips that are incredibly helpful for parents looking to find ways to support their family travel and even be able to quit their job altogether. Equally as impressive is their travel schooling section, which features open, honest pieces about educational philosophies, the intangible things that kids learn from travel and even book recommendations for kids of various ages that can help them learn the value of their adventures. 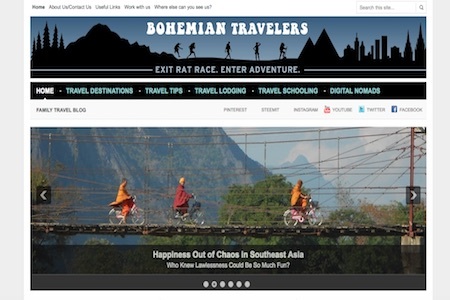 We especially loved the easy-to-navigate layout of the blog and the variety of destinations covered, which take you as far away as Southeast Asia and even to Central America. Travelling as a family is great, but it's even more fun if you can do so on a budget. Deal Mommy is your go-to place for all things finance-related to family travel as it's home to money-saving hacks and tips on how to avoid financial pitfalls. If you’ve had your fill of travel tips and destination guides, then you’ll want to switch gears and enjoy the money-saving travel hacks found on Deal Mommy. The author, who is the author of Amazon #1 best-seller Disney World Hacks, is a mother to a tween and teen and loves to share her financial money-saving tips with other travelling families. What’s particularly great about this blog is the touching mom vibes that the author pours into her posts, with articles that include tips on how to visit colleges with your teens as a mother and even how to avoid the top mom road trip fails. She lends a unique voice to her content and it makes for a wonderful read that will also provide you with some of the best tips on how to travel on a budget or even learn how to save before the trip to make it even more enjoyable with your family. Featuring an impressive layout that looks similar to that of a travel magazine, Spacei in Your Case provides parents with traditional travel tips as well as date night ideas, which is something we can definitely get behind. Space in Your Case’s manifesto says it all. The parents behind the blog note that they are dedicated to providing a space for families to gain the confidence needed to start their journey with inspiring bucket lists. Their aim is to “help parents to craft the story of their family’s lifetime as they travel.” The blog is filled with particularly helpful information that ranges from date night ideas without the kids to glamping and even sea-filled adventures. This is what particularly stands out about Space in Your Case, the superb organisation that makes it easy to locate exactly what you’re looking for. The well-written and very visual content doesn’t hurt either. While the blog covers a lot of international travel, it’s also great due to the amount of UK-based travel articles and tips that are easy for domestic travel if that’s your style too. Be sure to check out their gadgets and gear section to get exclusive tips and reviews on products that will make travelling with kids easier. 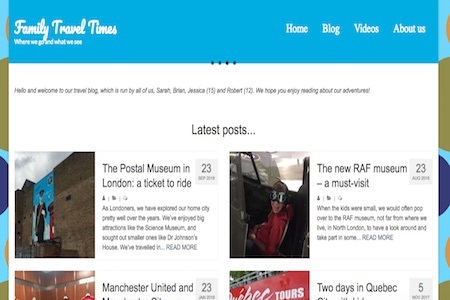 Superb video content that covers a variety of different countries plus a special UK-focused section make Mini Travellers a well-rounded blog that follows the life of two parents and their three kids, two of whom are twins. If you’re looking for outstanding travel videos featuring families, Mini Travellers is the place for you. While the blog is home to a lot of great written content, it’s the impressive travel videos featuring the children that make it so wonderfully delightful. From Greece to Disneyland and Rwanda to Wales, this blog follows two parents and their adorable little girls, two of whom are twins, which is a special touch for any parents of twins who think travelling might be a little hectic. What’s extra special about this particular blog is that it features a family-friendly festival section that dissects and reviews festivals all around the world that are fun and suitable for kids. The travel content is great, but this is a nice little touch that sets it apart from other blogs. 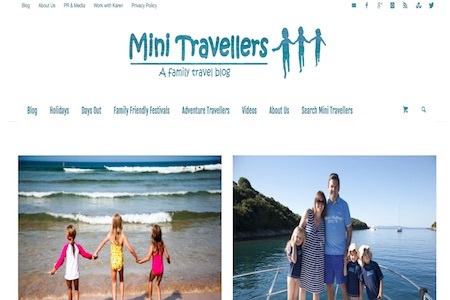 In similar fashion to other family travelling blogs, Mini Travellers has a “Days Out” section that reviews a lot of UK-local events, trips, and things to do. If you and your family are fans of theatre, you’ll definitely want to check this out. If you think that having kids means you can't travel, then think again. Have Kids, Can Travel is dedicated to showing parents just how easy it is to travel with children, even if you're heading to far-away places . When you’re tired of all the normal parental obligations and don’t feel very inspired to travel, Have Kids Can Travel is the place you’ll want to look. This blog covers the traditional city guides and hacks for travellling as a family, but it’s actually saturated with hundreds of city inspiration articles that will help you feel inspired to get out and explore the world with your children. We especially love that this blog offers great discount codes for families planning their adventures, and has a wide range of categories they write about, from children-free breaks to travel gear and city tripping versus remote adventures. It feels important to note that this blog publishes a lot of travel content geared toward teens as well, which is great if your kids are a little bit too old to still enjoy Disney trips and simple days with mom and dad at the beach. London-based families will love this blog, as it features great Days Out activities and even low-cost guides to enjoying London as a local. However, inspirational guides and international travel desintations are covered as well. London locals will enjoy this aesthetically-pleasing and well put together travel blog. The Pigeon Pair and Me actually looks and reads like a proper magazine with the impressive layout and the lengthy yet well-constructed articles. 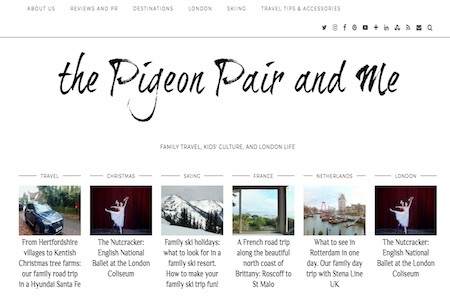 While they cover travel tips and destinations all over the world, they’re particularly keen on publishing content of how to enjoy London as a family for people from the UK or abroad. Their guides often focus on low-cost or even free activities that you can enjoy as a family, which is great when you’ve caught the travel bug and can’t seem to stop spending your savings on plane tickets. The photos they publish of their travels are downright adorable and the blog is filled with equal parts travel tips and other inspirational guides that’ll have you packing up your family to fly away from home the next chance you get. Families who are particularly fond of skiing will also love this blog as it seems that the Pigeons do too and publish lots of content about skiing as a family. This blog masters the art of outstanding family travel videos and includes a variety of content for families, such as travelling with the grandparents or even living it up on a cruise as a solo mum. 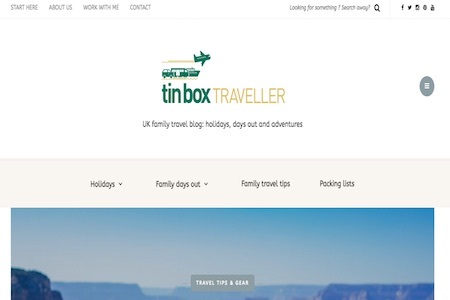 Impressively edited travel videos and helpful blogs that allow you to truly immerse yourself in the family’s travel experiences, Tin Box Travellers is a well-crafted blog that uses video and images to differentiate itself from others. The family notes that their content is written from a family’s perspective, but is unique in that some of the trips have been taken as a family of four, as a solo mum with kids or even with the much-needed help of grandparents. The articles featuring travel tips while travelling with kids and grandparents are especially enlightening and might have you calling up your parents before booking the tickets for your next international adventure. Tin Box Travellers seems to also post a lot of great content specifically about family cruises, resort packages and cottage life, all of which are helpful for families looking to explore the world in a luxurious yet economical way. This self-proclaimed travelogue/memoir/meditation on motherhood not only provides great travel hacks but also interesting insights to mindful travel and what that can mean to your kids. The mother who is behind The Mother of All Trips doesn’t play around. When her oldest son was just a wee one-year-old baby, she and her husband took him on a trip across six states, three countries, and two continents. If that’s not indicative of how much of an expert she is at travel, then we don’t know what is. The author of most of the blogs, Mara, notes that the content is “part travelogue, part memoir, part meditation on motherhood, with just a dash of how-to.” This couldn’t be a more perfect explanation of the content on the blog. The articles are particularly centered around “mindful travel,” which is the art of learning how to slow down and enjoy the moment without getting caught up in Instagramming the monument and being present with your children. These philosophies, combined with great travel tips and awesome photos, really make this blog shine. An insightful guide to everything luxe and high-end, Posh Brood covers how to travel in style with your children. With reviews and recommendations on hip cottages, upscale hotels and even villas, this is one blog you can't miss. Lovers of the finer things in life will enjoy the Posh Brood, which is a self-proclaimed guide to upscale, luxe and hip cottages, hotels, villas, resorts and inns. This blog proves that travelling with children doesn’t always have to mean staying in hotels that cater to kids. 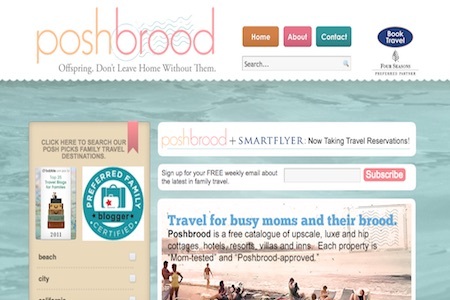 The Posh Brood is here to show all busy moms that they can have their cake and eat it too, that they can enjoy spending time with their children while also enjoying the finer things in life, like a relaxing bath in a five-star hotel that celebrities visit. The great thing about this blog is that it’s not only a travel blog but it’s also a full-fledged travel agency that offers a free bi-weekly newsletter offering celebrity interviews, family travel advice, steals, mom giveaways, and even reviews on travel gear that moms shouldn’t have to live without. Overall, this blog is recommended for families looking for great reviews on accommodation as well as those looking to experience some of the finer things in life with their children in tow. Especially great for parents of children who love Harry Potter and Disney, this blog covers a variety of content and stands out for the blogs that are written by the couple's children themselves. Any parent of a kid who loves Harry Potter, Disney and getting lost in a good book should definitely check out Gone with the Family. This blog is mainly centered around travelling with kids who are in their tweens or early teens and who love to learn while on and adventure. 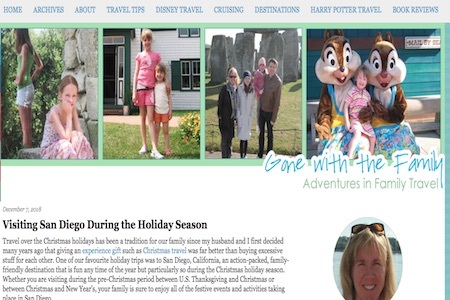 With a lot of great coverage surrounding their travels to Disney and Harry Potter-themed resorts, Gone with the Family is equally great for the book reviews they publish of inspiring novels and even magazines that children in a travelling family might love and be able to learn from. This blog has been around since 2011, making it one of the most insightful and helpful family travel blogs out there despite the fact that the family has been travelling with their oldest daughter for over 22 years now. The “Destinations” section is filled with guides to cities in North America, Europe, Australia and New Zealand, so if you’re planning on taking a trip to one of these continents, be sure to check this section out. If your children are pre-teen or teens, you'll love this blog that uses their England-based (and sometimes international) adventures to inspire other families to get out and explore the world. Ideal for families of pre-teens and teens, Family Travel Times is a great blog that follows the adventure of an England-based family and their two children. With content covering top travel destinations in Europe as well as the rest of the world, this blog is especially helpful for those based in the UK who are looking for interesting travel inspiration and guides in London, throughout England and throughout the rest of the United Kingdom. 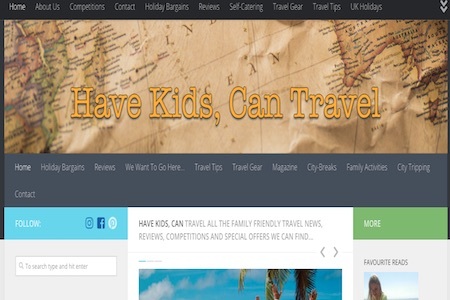 With great blogs dedicated to day trips that families with children can take in the UK, this travel blog is ideal for families who are just getting started out on their travels and want to start small and build their way up to bigger adventures (which Family Travel Times has also covered as well). One of the most memorable things about this blog is that some of the content is written by their children, which makes for an interesting and unique viewpoint not seen on various other travel blogs. With a special focus on the northeastern part of the UK, this family travel blog shines for its travel hacks as well as love for food and publishing great family recipes to try at home or on the road. 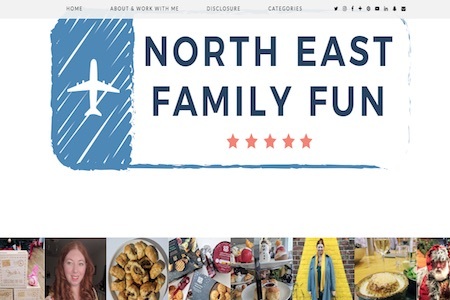 The family behind North East Family Fun is a family of 5 based in Northumberland, UK that loves good food, trying new things, and the great outdoors. Their love of food is especially important as a lot of their content is focused around either great on-the-go recipes to try as a travelling family or a review of the food they’ve tried while on their adventures, such as the impressively delicious pretzels from a trip to Disney World or a yummy Christmas cake recipe. With categories that range from Camping and Christmas to even one dedicated to Grown-Up Getaways, this blog reads more like a lifestyle magazine than a family travel blog and we absolutely love it for that. If your family is based in the northeastern part of the UK, you’ll find this blog particularly helpful, as they also post restaurant reviews and travel guides specific to the northeast.